The Piasecki H-21 Workhorse/Shawnee is an American helicopter, the fourth of a line of tandem rotor helicopters designed and built by Piasecki Helicopter (later Boeing Vertol). Commonly called "the flying banana", it was a multi-mission helicopter, utilizing wheels, skis, or floats. The H-21 was originally developed by Piasecki as an Arctic rescue helicopter. The H-21 had winterization features permitting operation at temperatures as low as −65 °F (−54 °C), and could be routinely maintained in severe cold weather environments. In 1949, Piasecki proposed the YH-21 Workhorse to the United States Air Force (USAF), which was an improved, all-metal derivative of the HRP-1. Using two tandem, fully articulated three-bladed counter-rotating rotors, the H-21 was powered by one nine-cylinder Curtis-Wright R-1820-103 Cyclone supercharged 1,150 hp (858 kW) air-cooled radial engine. After its maiden flight in April 1952, the USAF ordered 32 H-21A SAR models and 163 of the more powerful H-21B assault transport variant. The H-21B was equipped with an uprated version of the Wright 103 engine, developing 1425 shaft horsepower (1063 kW), and featured rotor blades extended by 6 inches (152 mm). With its improved capabilities, the H-21B could carry 22 fully equipped infantrymen, or 12 stretchers, plus space for two medical attendants, in the medevac role. With its Arctic winter capabilities, the H-21A and H-21B were put into service by both the USAF and the Royal Canadian Air Force (RCAF) to maintain and service DEW (Distant Early Warning) radar installations stretching from the Aleutian Islands and Alaska across the Canadian Arctic to Greenland and Iceland. In 1956, seeking a way to use helicopters in a ground-attack role in the Algerian War, the French Air Force and French Army Aviation (Aviation Légère de l'Armée de Terre) experimented with arming the Sikorsky S-55, then being superseded in service by the more capable Piasecki H-21 and Sikorsky H-34 helicopters. Some French Air Force and Army aviation H-21C helicopters were subsequently armed with fixed, forward-firing rockets and machine guns. A few even had racks for bombs, but tests subsequently determined that the H-21C lacked the maneuverability and performance needed in the ground-attack role. The H-21C was far more successful as a troop transport, and most H-21Cs in service were eventually fitted with flexible door-mounted guns such as the .50 cal. (12.7 mm) M2 Browning machine gun or the (ex-German) MG 151/20 20 mm aircraft cannon for defensive use when landing assault forces under fire. Though the H-21 had been removed from the ground-attack role, official U.S. Army evaluations at the time indicated that the type was actually more likely to survive multiple hits by ground fire than was the Sikorsky CH-34; this was assumed to be a consequence of the location and construction of the CH-34's fuel tanks. By the close of the Algerian War, troop-carrying H-21C helicopters were being used in concert with H-34 ground-attack helicopters in large-scale counterinsurgency operations. The H-21C saw extensive service with the U.S. Army, primarily for use in transporting troops and supplies. On 24 August 1954, with the assistance of inflight refueling provided by a U.S. Army U-1A Otter, a H-21C known as Amblin' Annie became the first helicopter to cross the United States nonstop. Various experiments were made by the Army in arming the H-21C as a gunship; some Shawnees were armed with flex guns under the nose, while others were fitted with door guns. One experimental version was tested stateside with a Boeing B-29 Superfortress .50 cal. remote turret mounted beneath the nose. The H-21C (later designated CH-21C) was first deployed to Vietnam in December 1961 with the Army's 8th and 57th Transportation Companies, in support of Army of the Republic of Vietnam troops. In Army service, the CH-21C Shawnee could be armed with 7.62 mm (.308 in) or 12.7 mm (.50 in) flexible door guns. 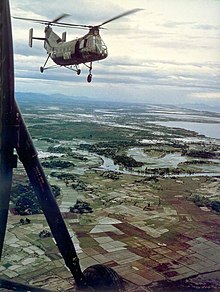 Relatively slow, the CH-21's unprotected control cables and fuel lines proved vulnerable to the enhanced threat posed by North Vietnamese Army and Vietcong ground forces, which were increasingly well supplied with automatic small arms and heavy (12.7 mm) AA machine guns. The H-21, which was designed for cold weather operations, performed poorly in the hot weather of Vietnam. Despite being capable of carrying 20 passengers, it carried only nine when operating in Vietnam. The shooting down of a CH-21 Shawnee near the Laotian-Vietnamese border with the death of four aviators in July 1962 were some of the U.S. Army's earliest Vietnam casualties. Despite these events, the Shawnee continued in service as the U.S. Army's helicopter workhorse in Vietnam until 1964 when it was replaced with the Bell UH-1 Huey. In 1965, the Boeing CH-47 Chinook was deployed to Vietnam, and later that year, most CH-21 helicopters were withdrawn from active inventory in the U.S. Army and Air Force. USAF designation of the first H-21 prototype. Same as H-21A but with uprated Wright engine (1425hp) and seats for 20 troops, autopilot as standard and limited armour protection and external fuel tanks, became CH-21B in 1962, 163 built for U.S. forces. 10 built for Japanese Self-Defense Forces; 10 H-21B built for the French Navy. Rescue conversion of the H-21B, became HH-21B in 1962. US Army version of the H-21B, became CH-21C in 1962, 334 built for U.S. forces. 32 built under license by Weser Flugzeugbau for the West German Army. 98 built for the French Air Force and French Army Aviation (ALAT). Two H-21Cs re-engined with two General Electric T58 turboshaft engines in place of the Wright R-1820. Not placed into production. Conversion by Vertol Aircraft (Canada) of eight Royal Canadian Air Force H-21s for civilian use. Equipped to carry 19 passengers or 2,820lb (1,279kg) of internal cargo or a 5,000lb (2,268kg) slung load. Commercial 19-passenger transport version of the H-21B. 11 total (Swedish military designation: Hkp 1), 2 for the Swedish Air Force, 9 for the Swedish Navy. 2 used for test/evaluation purposes by Japan Self-Defense Forces. Commercial 15-passenger/freighter version of the H-21B. Commercial eight-passenger executive version of the H-21B. FR94 – H-21C on static display at the Musée de l'Aviation Légere de l'Armée de Terre et de l'Hélicoptère in Dax, Landes. FR106 is on display at the "Ailes Anciennes" Museum at Toulouse-Blagnac Airport. 83+07 – H-21C on static display at the Hubschraubermuseum Bückeburg in Bückeburg, Lower Saxony. 83+08 – H-21C on static display at the Militärhistorisches Museum Flugplatz Berlin-Gatow in Berlin, Berlin. 83+11 – H-21C on static display at the Flugausstellung Hermeskeil in Hermeskeil, Rhineland-Palatinate. 83+17 – XH-21D on static display at the Auto & Technik Museum Sinsheim in Sinsheim, Baden-Wurttemberg. JG-0001 – Model 44A on static display at the Bihoro Aviation Park in Bihoro, Hokkaido. JG-0002 – Model 44A on static display at the Tokorozawa Aviation Museum in Tokorozawa, Saitama. 02-4756 – H-21B on static display at the JASDF Air Park in Hamamatsu, Shizuoka. N74056 – Model 44A on static display at Central Air Force Museum in Monino, Moscow. Hkp 1 on static display at the Swedish Air Force Museum in Linköping, Östergötland. 54-4001 – CH-21B airworthy at the Classic Rotors Museum in Ramona, California. This is the last H-21 still flown. 51-15857 – CH-21B on static display at the National Museum of the United States Air Force at Wright-Patterson AFB in Dayton, Ohio. It was obtained from Eglin Air Force Base in January 1965. 51-15859 – CH-21B on static display at Battleship Memorial Park in Mobile, Alabama. 51-15886 – CH-21C on static display at the Aerospace Museum of California at McClellan Airport (former McClellan AFB) in McClellan, California. 51-15892 – CH-21B on static display at the Quonset Air Museum at the former Naval Air Station Quonset Point in North Kingstown, Rhode Island. 52-8676 – CH-21B on static display at the Strategic Air Command & Aerospace Museum near Offutt AFB in Ashland, Nebraska. 52-8685 – CH-21B on static display at the Museum of Aviation at Robins AFB near Warner Robins, Georgia. 52-8688 – CH-21B on static display at the Travis Air Force Base Heritage Center near Fairfield, California. 52-8691/52-8706 – CH-21B on static display at Kirtland Air Force Base in Albuquerque, New Mexico. This airframe is a composite of two different airframes and is painted as 53-4343. 52-8696 – CH-21B on static display at Joint Base Elmendorf-Richardson near Anchorage, Alaska. 53-4323 – HH-21B on static display at Berryman War Memorial Park in Bridgeport, Washington. 53-4324 – CH-21B on static display at the Vintage Flying Museum in Fort Worth, Texas. This airframe was previously on display at the Pate Museum of Transportation in Cresson, Texas. 53-4326 – CH-21B on static display at the March Field Air Museum at March Air Reserve Base (former March AFB) in Riverside, California. 53-4347 – CH-21B on static display at the Pueblo Weisbrod Aircraft Museum in Pueblo, Colorado. 53-4354 – CH-21C on static display at the Arkansas Air & Military Museum in Fayetteville, Arkansas. 53-4362 – SH-21B on static display at the Alaska Museum of Transportation and Industry in Wasilla, Alaska. 53-4366 – CH-21B on static display at the Museum of Flight in Seattle, Washington. This airframe was previously on display at the Canadian Museum of Flight in Langley, British Columbia. 53-4367 – CH-21B on static display at the Mid-Atlantic Air Museum, Reading, Pennsylvania. 53-4369 – CH-21B on static display at the United States Army Aviation Museum near Fort Rucker in Daleville, Alabama. 53-4389 – CH-21B on static display at the Pima Air & Space Museum adjacent to Davis-Monthan AFB in Tucson, Arizona. 54-4404 – CH-21B on static display at the Alaska Aviation Heritage Museum in Anchorage, Alaska. 55-4140 – CH-21C on static display at the American Helicopter Museum & Education Center in West Chester, Pennsylvania. This airframe was previously on display at the Intrepid Sea, Air & Space Museum in New York, New York. 55-4218 – CH-21C on static display at the Evergreen Aviation & Space Museum in McMinnville, Oregon. This airframe was previously on display at the Wings Over the Rockies Air and Space Museum at the former Lowry AFB in Denver, Colorado. It is painted as 53-4379. 56-2040 – CH-21C on static display at the United States Army Aviation Museum at Fort Rucker, near Daleville, Alabama. 56-2077 – CH-21C on static display at the U.S. Army Transportation Museum ay Fort Eustis near Newport News, Virginia. 56-2142 – CH-21C on static display at the Hill Aerospace Museum at Hill AFB near Ogden, Utah. This airframe is painted as 54-4002. 56-2159 – CH-21C on static display at the Pima Air & Space Museum adjacent to Davis-Monthan AFB in Tucson, Arizona. 52-8623 – CH-21B in storage at the Air Force Flight Test Museum at Edwards AFB in Edwards, California. 52-8683 – H-21B in storage with Basler Turbo Conversions in Oshkosh, Wisconsin. 53-4329 – CH-21B under restoration at the Museum of Flight Restoration Center at Paine Field in Everett, Washington. 54-4003 – CH-21B in storage at the American Helicopter Museum & Education Center in West Chester, Pennsylvania. This airframe was previously on display at the Florence Air & Missile Museum in Florence, South Carolina. c/n 438 – Model 44B in storage in unrestored condition at the Gillespie Field Annex of the San Diego Air & Space Museum in El Cajon, California. Varying, but usually one or two .50 (12.7 mm) or 7.62 mm M60 machine guns. ^ "Here Comes the Leathernecks." Popular Mechanics, April 1952, p. 101, bottom of page. ^ "Workhorses of the Air." Popular Mechanics, March 1959, p. 100. ^ "World Air Forces 1955 pg. 621". flightglobal.com. Retrieved 4 August 2018. ^ Arkell Flight 21 June 1957, p. 844. ^ "World Helicopter Market 1967 pg. 60". flightglobal.com. Retrieved 4 August 2016. ^ "aéronautique navale H-21". helis.com. Retrieved 5 January 2013. ^ a b "World Helicopter Market 1967 pg. 62". Flightglobal Insight. 2018. Retrieved 4 August 2018. ^ "World Helicopter Market 1967 pg. 65". flightglobal.com. Retrieved 4 August 2016. ^ Flight 13 May 1955, p. 668. ^ "World Helicopter Market 1967 pg. 61". flightglobal.com. Retrieved 4 August 2016. ^ "Helicopters in Civil Operations pg. 388". flightglobal.com. 21 March 1958. Retrieved 10 February 2015. ^ "Harold A. Skaarup, author of Shelldrake". silverhawkauthor.com. Retrieved 6 January 2019. ^ "Airframe Dossier - Piasecki-Vertol H-21C-PH Shawnee, s/n FR94 AdT, c/n FR94". Aerial Visuals. AerialVisuals.ca. Retrieved 21 October 2016. ^ "Ailes Anciennes Toulouse". aatlse.org. Retrieved 23 November 2016. ^ "Vertol V-43 (H-21C)". Das Hubschraubermuseum Bückeburg. Retrieved 21 October 2016. ^ "Airframe Dossier - PiaseckiH-21, s/n 83+07 Heeresfliegertruppe, c/n WG7". Aerial Visuals. AerialVisuals.ca. Retrieved 21 October 2016. ^ "Transporthubschauber Vertol (Piasecki) V-43A (H-21C) (Luftfahrzeugkennung der Bundeswehr: 83+08)". Militärhistorische Museum der Bundeswehr Flugplatz Berlin Gatow (in German). 2 January 2016. Retrieved 20 October 2016. ^ "Flugzeuge". Flugausstellung. Archived from the original on 31 December 2015. Retrieved 21 October 2016. ^ "Airframe Dossier - PiaseckiH-21, s/n 83+17 Luftwaffe, c/n WG17". Aerial Visuals. AerialVisuals.ca. Retrieved 21 October 2016. ^ a b Thompson, Paul. "JGSDF – Where Are They Now?". J-Hangar Space. J-HangarSpace. Retrieved 21 October 2016. ^ "Experience Exhibits". Tokorozawa Aviation Museum. Tokorozawa Aviation Museum. Archived from the original on 14 March 2016. Retrieved 21 October 2016. ^ "Airframe Dossier - Piasecki 44A, s/n 50002 JASDF, c/n 44-20". Aerial Visuals. AerialVisuals.ca. Retrieved 21 October 2016. ^ "Airframe Dossier - Piasecki-Vertol CH-21B Work Horse, s/n 02-4756 JASDF, c/n B148". Aerial Visuals. AerialVisuals.ca. Retrieved 21 October 2016. ^ Thompson, Paul. "JASDF – Where Are They Now?". J-HangarSpace. J-HangarSpace. Retrieved 21 October 2016. ^ "Airframe Dossier - Piasecki 44C, c/n 44-417, c/r N74056". Aerial Visuals. AerialVisuals.ca. Retrieved 21 October 2016. ^ "Hkp 1". flygvapenmuseum (in Swedish). 21 April 2010. Archived from the original on 13 August 2010. Retrieved 21 October 2016. ^ "Vertol H-21 Shawnee/Work Horse". Classic Rotors. Retrieved 20 October 2016. ^ "FAA REGISTRY [N64606]". Federal Aviation Administration. U.S. Department of Transportation. Retrieved 20 October 2016. ^ "Vertol CH-21B Workhorse". National Museum of the US Air Force. 29 May 2015. Retrieved 20 October 2016. ^ "AIRCRAFT COLLECTION". Battleship Memorial Park. USS ALABAMA. Archived from the original on 28 December 2016. Retrieved 20 October 2016. ^ "Airframe Dossier - Piasecki-Vertol CH-21B Work Horse, s/n 51-15859 USAF, c/n B.6". Aerial Visuals. AerialVisuals.ca. Retrieved 20 October 2016. ^ "Airframe Dossier - Piasecki CH-21C Shawnee, s/n 51-15886 US, c/r N48082". Aerial Visuals. AerialVisuals.ca. Retrieved 20 October 2016. ^ Carroll, Sean. "[Untitled]". Retrieved 21 October 2016. ^ "Airframe Dossier - Piasecki-Vertol H-21B Work Horse, s/n 52-8688 USAF, c/r N6795". Aerial Visuals. AerialVisuals.ca. Retrieved 20 October 2016. ^ "Airframe Dossier - Piasecki UH-21B Work Horse, s/n 52-8691 USAF". Aerial Visuals. AerialVisuals.ca. Retrieved 21 October 2016. ^ "Heritage Park Tour Briefing" (PDF). Matanuska-Susitna Borough School District. May 2007. Retrieved 21 October 2016. ^ "Airframe Dossier - PiaseckiH-21, s/n 53-4323 USAF, c/n B.73, c/r N6793". Aerial Visuals. AerialVisuals.ca. Retrieved 21 October 2016. ^ "Piasecki CH-21B Workhorse". Vintage Flying Museum. Retrieved 20 October 2016. ^ "Airframe Dossier - Piasecki CH-21B Work Horse, s/n 53-4324 USAF, c/n B74". Aerial Visuals. AerialVisuals.ca. Retrieved 21 October 2016. ^ "H-21 Workhorse". March Field Air Museum. March Field Air Museum. Retrieved 20 October 2016. ^ "Actual Aircraft Aircraft on Display in Pueblo". Pueblo Weisbrod Aircraft Museum. Archived from the original on 25 December 2016. Retrieved 20 October 2016. ^ "Airframe Dossier - PiaseckiH-21, s/n 53-4354 USAF". Aerial Visuals. AerialVisuals.ca. Retrieved 8 November 2016. ^ "Airframe Dossier - PiaseckiH-21, s/n 53-4362". Aerial Visuals. AerialVisuals.ca. Retrieved 20 October 2016. ^ "Piasecki H-21B (CH-21B) Workhorse". The Museum of Flight. The Museum of Flight. Retrieved 20 October 2016. ^ "Aircraft of the Mid-Atlantic Air Museum". Mid-Atlantic Air Museum. Retrieved 20 October 2016. ^ "Airframe Dossier - Piasecki HH-21B Work Horse, s/n 53-4369 US, c/r N109RB". Aerial Visuals. AerialVisuals.ca. Retrieved 21 October 2016. ^ "Airframe Dossier - Piasecki-Vertol CH-21B Work Horse, s/n 53-4389 USAF, c/n B.139". Aerial Visuals. AerialVisuals.ca. Retrieved 20 October 2016. ^ "Airframe Dossier - Piasecki H-21B Work Horse, s/n 54-4004 USAF". Aerial Visuals. AerialVisuals.ca. Retrieved 20 October 2016. ^ "Piasecki H-21 / CH 21B Workhorse". American Helicopter Museum & Education Center. American Helicopter Museum & Education Center. Archived from the original on 21 October 2016. Retrieved 21 October 2016. ^ "Airframe Dossier - Piasecki CH-21C Shawnee, s/n 55-4140 US, c/n C.94". Aerial Visuals. AerialVisuals.ca. Retrieved 21 October 2016. ^ "Helicopters". Evergreen Museum Campus. Evergreen Museum. Retrieved 20 October 2016. ^ "Airframe Dossier - PiaseckiH-21, s/n 55-4218 US Army". Aerial Visuals. AerialVisuals.ca. Retrieved 20 October 2016. ^ "Airframe Dossier - Piasecki CH-21C Shawnee, s/n 56-2040 US, c/n C.202". Aerial Visuals. AerialVisuals.ca. Retrieved 21 October 2016. ^ "Airframe Dossier - Piasecki CH-21C Shawnee, s/n 56-2077 US, c/n C.239". Aerial Visuals. AerialVisuals.ca. Retrieved 21 October 2016. ^ "CH-21C "Workhorse"". Hill Air Force Base. 27 September 2007. Retrieved 20 October 2016. ^ "Aircraft Inventory". Flight Test Historical Foundation. Flight Test Historical Foundation. Retrieved 21 October 2016. ^ "Airframe Dossier - Piasecki H-21B Work Horse, s/n 52-8683 USAF, c/n B.45, c/r N57968". Aerial Visuals. AerialVisuals.ca. Retrieved 21 October 2016. ^ "Airframe Dossier - PiaseckiH-21, s/n 53-4329 USAF, c/r N6794". Aerial Visuals. AerialVisuals.ca. Retrieved 21 October 2016. ^ "Airframe Dossier - Piasecki-Vertol H-21B Work Horse, s/n FR09 AdT, c/n B.155". Aerial Visuals. AerialVisuals.ca. Retrieved 21 October 2016. ^ "Airframe Dossier - Piasecki 44B, c/r N74058". Aerial Visuals. AerialVisuals.ca. Retrieved 17 November 2016. Arkell, Basil. "Helicopters in Contrast: (2) Flying the American Vertol 44". Flight, Vol. 71, No. 2526. pp. 844–846. Duke, R.A., Helicopter Operations in Algeria [Trans. French], Dept. of the Army (1959). Swanborough, F. G. and Bowers, Peter M. United States Military Aircraft since 1909. London: Putnam, 1963. "The World's Air Forces". Flight, Vol. 67, No. 2416, 13 May 1955. pp. 615–668. "World Helicopter Market". Flight, Vol. 94, No. 3096, 11 July 1968. pp. 48–60. Wikimedia Commons has media related to H-21 Shawnee. This page was last edited on 12 April 2019, at 13:23 (UTC).